Over the holiday weekend I got a lot done around the house in terms of projects, some that has been in the making for like ever and some that totally started to take shape the last few weeks. Yup, we are finally on the home stretch on the cane chairs but the room that has taken me by surprise on how fast it has evolved into a project is the upstairs guest bedroom. More on that in the coming days but for now my Campaign story. What would compel a grown woman to show up at a stranger’s house, money in hand? I’m totally borrowing this line from Gina of Charming Zebra. As I read this first line of her post all I could think of was, “That was me this Saturday!” Let’s rewind a little bit. 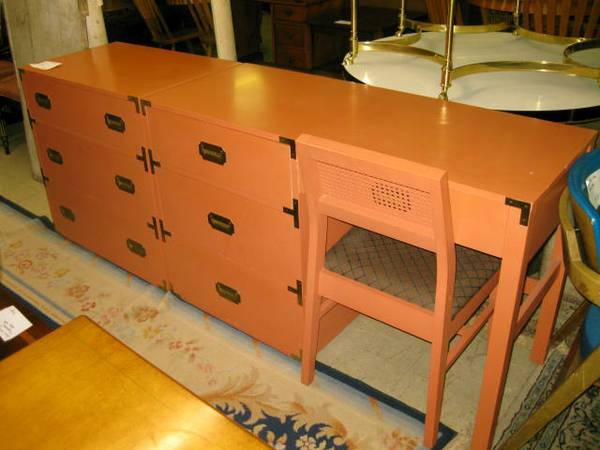 Back in Feb I told you how I was lusting after Campaign furniture on Craigslist. Every time I saw a piece that was close to my budget I would follow up in vain. In some cases the buyer would respond only to back out later quoting a higher offer. Last week I spotted 3 dressers, the first 2 for $30 and the third as a set with a desk and chair for $175. #1 – Tall dresser – had no idea where I would use it. #2 Really wanted this, would have worked in a lot of places in our home. 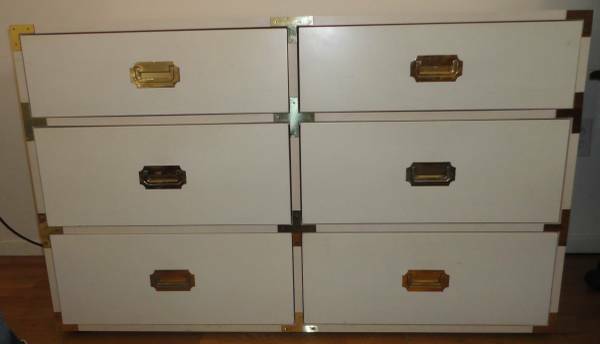 #3 The dresser would have been perfect for that empty plant corner in our living room. 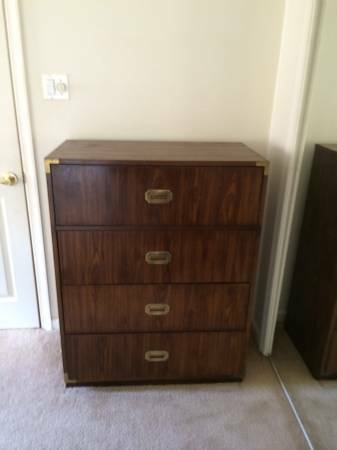 I had offered $60 for just the dresser but seller #3 came back saying that he wanted to keep the set together and that someone had already offered $100 for it. Seller #2 never responded but got good news from #1! Yay, I said I would pick it up on Saturday. Just as I was heading out the door to drive an hour into the Blue Ridge Mountains to get my Campaign dresser, B had second thoughts and said he would go instead. Can’t tell you how happy and relieved I was to hear those words. Frankly I had my own reservations about the place, it was close to the Skyline Meadows state park, but my DIY thirsty hands badly wanted to makeover a Campaign dresser. 🙁 Once at the place he called me and said, “This is the last time you are buying something off Craigslist”. He was not at all impressed by the deserted location or the house or the person. But we did get my Campaign dresser! Here she is in our garage waiting to be painted. 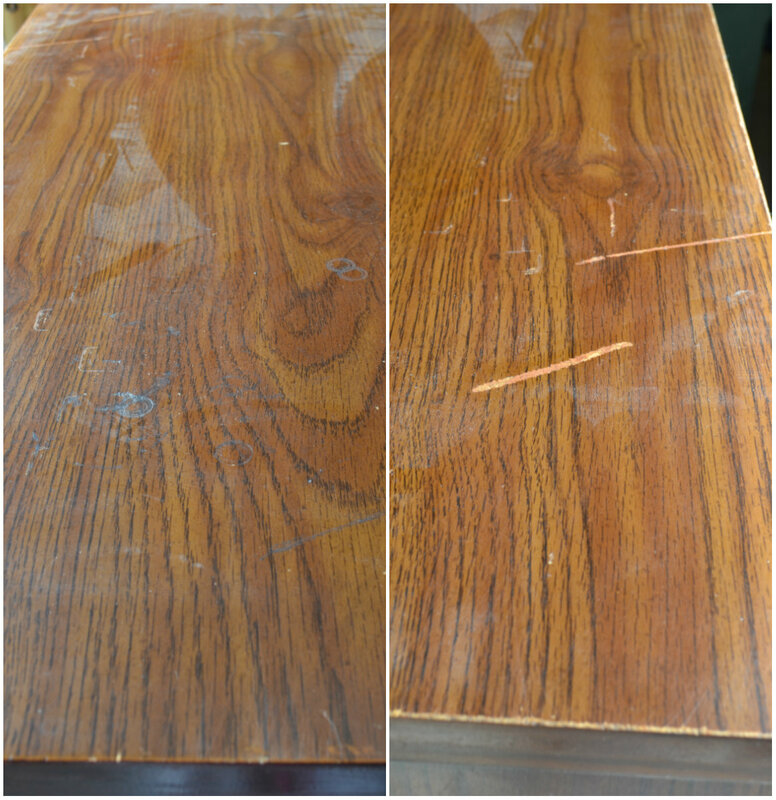 Don’t be fooled by this pic, the finish on the dresser is bad; there are dings, scuff marks and stains in places. The plan for now is to use it in the upstairs guest bedroom (see I told ya). Not sure what color I’m gonna paint it though. Have you found anything on Craigslist lately? Actually I did find something else too, the only item that I picked up myself. In every other case my wonderful husband has been gracious enough to pick up my Craigslist finds. Love you! Vidya, Glad you found your campaign dresser. I have been given numerous warning about not picking up stuffs off craigslist…..:-). Recently, I bought 4 bentwood chairs. In perfect condition. 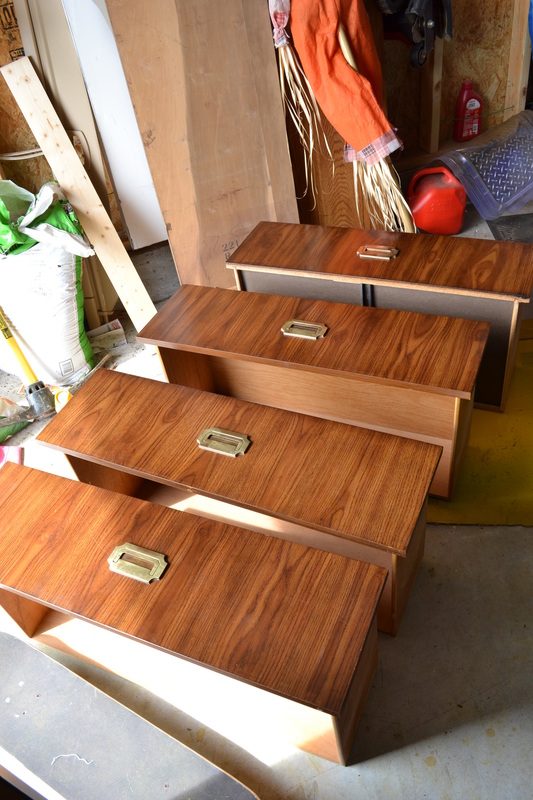 For $10 each….waiting to start my work on them. Looking forward to see your dresser makeover. I got a library card catalog off Craigslist recently. Not cheap, but I was thrilled to snag one after years of trying to find one.